When I first created this blog, my intent was to share new art, reflect or comment with regularity. I have been distracted. With a brisk chill in the air, the colors of autumn a feast for eyes and seemingly a bit more time, I am making a new start at pulling this together. “these precious days” was inspired by an early morning hike with a friend and dogs the first of the week. 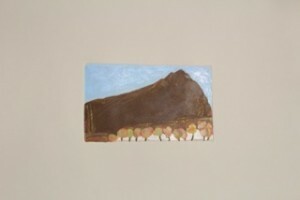 “East Peak” a small, multiple drop monotype, using water-based inks was produced last night. The turning of the season touches place and process.